Phosphorus is an essential nutrient for all life forms and the lack of it is one of the reasons the aquatic life of these alpine lakes is limited. Because phosphorus is not readily available from surrounding watersheds, aeolian dust (dust that is blown by the wind) becomes an important source of phosphorus to alpine lakes and can substantially affect aquatic ecosystems. 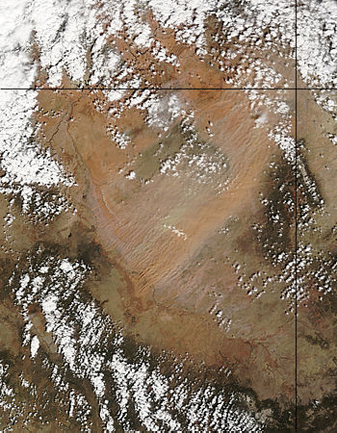 Much of the dust deposited to the Rockies is generated from the Colorado Plateau Desert, where high aridity and recent land-use changes promote wind erosion of soils to produce dust. Dust emission is expected to increase from the warming and drying deserts and plains of the American West. Such additional dust will likely deliver phosphorus concentrations to mountain ecosystems beyond amounts documented for recent decades. Using the SXRMB beamline at the CLS, the researchers were able to characterize the type of phosphorus in the dust and dust-source soils on the Colorado Plateau. Their work showed that the phosphorus in the dust is mainly bound to calcium. This form of phosphorus is unstable and will dissolve in acidified lakes. Considering the increasing dust input due to changes in the climate and land use and the acidification of these alpine lakes, this study suggests that the alpine lakes may not be limited in phosphorus in the future. An accumulation of phosphorous could result in more algal growth in alpine lakes. Such growth can decrease available oxygen for fish. This would adversely impact population of alpine lake fish, such as trout that require cold, well-oxygenated water, environmental conditions maintained only in oligotrophic lakes.